The uber off road vehicle is the Trophy Truck, the premiere builder in the class is Geiser Bros. and the Desert Assassins will come to the green flag with two of their trucks for the 2011 Tecate SCORE Baja 1000. The 2011 team will feature the “OG”, or original, Geiser Bros. truck as well as the newest Geiser effort as they have rolled the 33rd truck they have ever built into the DA stable. “The idea is to fortify the effort of our team and our partners including Yokohama Tire who bring their all new 40 inch tire to the Baja 1000 for the first time ever” said team driver Cameron Steele. Cameron will drive his trademark #16 Monster Energy/Yokohama Tire/Lucas Oil/KMC Wheels/ReadyLift truck off the line in Ensenada Friday November 18th with his long time navigator Cody Stuart. 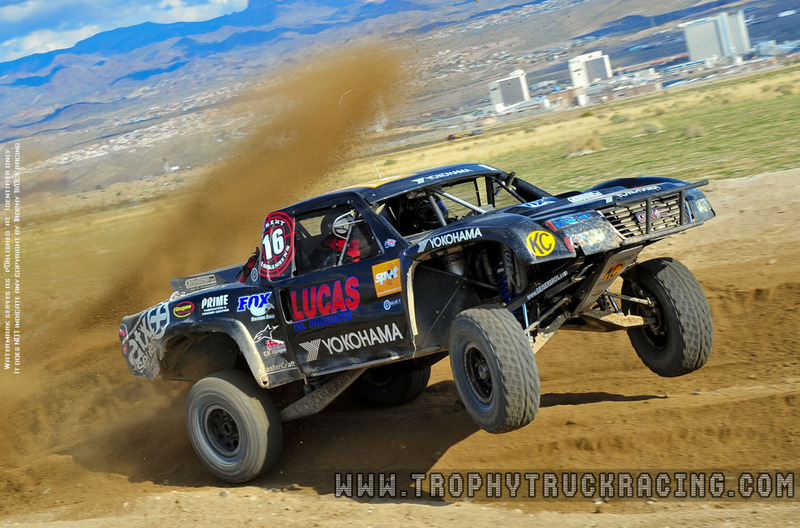 The second truck representing the Desert Assassins at the 2011 SCORE Baja 1000 will be the #14 truck driven by Rick Geiser. Rick and his brother Jeff are the preeminent builders in the class and Rick has both driven and engineered Trophy Truck Championships and wins. Geiser and Steele have been partners for most of the last four years and the two have chosen two stellar drivers to join them for this Baja 1000. Pat Dean of Las Vegas has a long family history of winning in off-road and teamed with Cameron for the 2010 Baja 1000 and will again take the wheel for the DA. New to the Baja 1000 driving squad is Josh Daniel who has been a part of the DA for years and has been driving Geiser Bros. Trophy Trucks for Riot Racing the last couple of years. “Originally we considered having two 3 driver teams and had been working on that much of the year but after John (Marking, who drove with the team at the Baja 500) had back surgery later this year Rick and I decided to go with a four driver squad for the two trucks” said Steele. The way the driving duties are set up Steele could very well drive both the #16 and #14 in this year’s event. Cameron is the only person to have driven a Trophy Truck, a limited buggy and ridden an Open Pro motorcycle in one Baja race so driving two Trophy Trucks would seem normal for Steele. “The team we have put together has been behind the wheel all year and the effort we will put forward at this Baja 1000 will give both trucks the opportunity to be on the podium” said Rick. “My section will be grueling and treacherous, however everyone knows how the Desert Assassins pre run and prepare for our sections. I plan on handing off the truck in good shape and in good position to give us the chance to win” said Daniel, who continued “Racing the Baja 1000 with one of my best friends (Steele) does it get any better than that”? The drawing for starting positions was October 15th and the team has drawn start positions 24 and 25 out of 32 trucks in the field. "The decision has yet to be made on who will drive which truck but I can tell you that I feel both trucks have an equal capability of winning" said Steele. The team recently finished 5th in the SCORE Challenge of Champions and 2nd in the Best in the Desert Blue Water Challenge. The #16 Monster Energy/Yokohama Tire/Lucas Oil/KMC Wheels/ReadyLift truck and the #14 ruck are also both supported by Yokohama Tire, Monster Energy, Lucas Oil Products, ReadyLift, MasterCraft, FOX Racing Shox, Currie Rear Ends, Bullet Proof Diesel, Patrick’s Signs, Metal Mulisha, KC Highlites, Alpinestars, Motive Gear, Dougans Racing Engines, Culhane Transmission, UNI Filter, Dailey Engineering Oil Pumps, and VP Fuels.